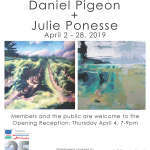 The Niagara Pumphouse is pleased to exhibit Common Ground, Featuring new paintings inspired by Niagara’s landscape by Daniel Pigeon and Julie Ponesse each reflecting their own style, Pigeon more abstract and Ponesse impressionistic and representative in nature. Please join us for the Opening Reception on Thursday April 4, 7-9 p.m. 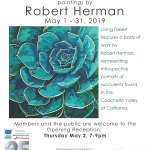 Living Desert features a body of work by Robert Herman which represents a collection of introspective portraits of succulents found in the Coachella Valley of California. 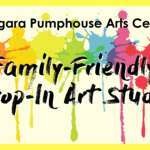 Please join us for the Opening Reception on Thursday May 2, 7-9 p.m.
Drop in to our Family Friendly Art Studio, on select Sundays to make your own artwork. 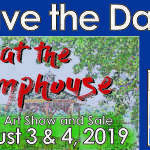 This is a great opportunity for the whole family to explore art and get creative!